Definition at line 20 of file DiskIOModule.h. Definition at line 37 of file DiskIOModule.h. Definition at line 36 of file DiskIOModule.h. We cannot call ModuleAdd(*this) here as the virtual methods are not yet available. We leave that to SetupAllModules() later. Definition at line 36 of file DiskIOModule.cc. Definition at line 39 of file DiskIOModule.h. References createStrategy(), DiskIOModule(), GetModules(), gracefulShutdown(), init(), operator=(), RegisterAllModulesWithCacheManager(), and type(). Definition at line 25 of file stub_libdiskio.cc. Implemented in DiskThreadsDiskIOModule, BlockingDiskIOModule, DiskDaemonDiskIOModule, IpcIoDiskIOModule, and MmappedDiskIOModule. Referenced by Fs::Ufs::UFSSwapDir::changeIO(), and ~DiskIOModule(). Definition at line 114 of file DiskIOModule.cc. References GetModules(), i, and NULL. Referenced by FindDefault(), Rock::SwapDir::init(), Rock::SwapDir::needsDiskStrand(), Fs::Ufs::UFSSwapDir::optionIOParse(), testUfs::testUfsSearch(), and Fs::Ufs::UFSSwapDir::UFSSwapDir(). Find any usable disk module. This will look for the 'best' available module for this system. Definition at line 124 of file DiskIOModule.cc. Called when a graceful shutdown is to occur of each fs module. Definition at line 104 of file DiskIOModule.cc. Definition at line 91 of file DiskIOModule.cc. 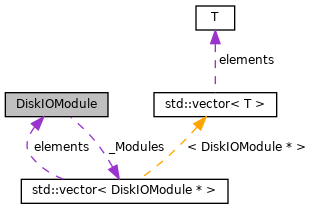 Referenced by Find(), FreeAllModules(), ModuleAdd(), Modules(), SetupAllModules(), and ~DiskIOModule(). Referenced by FreeAllModules(), and ~DiskIOModule(). Implemented in BlockingDiskIOModule, DiskDaemonDiskIOModule, DiskThreadsDiskIOModule, IpcIoDiskIOModule, and MmappedDiskIOModule. Definition at line 72 of file DiskIOModule.cc. References assert, GetModules(), i, and type(). 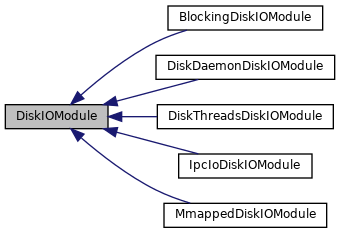 Referenced by BlockingDiskIOModule::BlockingDiskIOModule(), DiskDaemonDiskIOModule::DiskDaemonDiskIOModule(), DiskThreadsDiskIOModule::DiskThreadsDiskIOModule(), IpcIoDiskIOModule::IpcIoDiskIOModule(), and MmappedDiskIOModule::MmappedDiskIOModule(). Definition at line 85 of file DiskIOModule.cc. Definition at line 26 of file stub_libdiskio.cc. Definition at line 45 of file DiskIOModule.cc. References BlockingDiskIOModule::GetInstance(), DiskDaemonDiskIOModule::GetInstance(), DiskThreadsDiskIOModule::GetInstance(), IpcIoDiskIOModule::GetInstance(), MmappedDiskIOModule::GetInstance(), GetModules(), and i.
Referenced by testDiskIO::setUp(), and SquidMain(). Referenced by Fs::Ufs::UFSSwapDir::changeIO(), ModuleAdd(), and ~DiskIOModule(). Definition at line 57 of file DiskIOModule.h.